This Grandmother's Garden: Blooms! Blooms! Are there any Blooms out there? Blooms! Blooms! Are there any Blooms out there? What could possibly still be blooming in my gardens? It's GBBD and I woke up early to find the answer. and the Highland winds have now left our trees bare naked. Could there be any blooms out there? O-h-h but it's so frosty cold. you might become a plump little 'rose hip' like me." Hmm... that little rose may have missed her chance. It will have to warm up a whole lot for that to happen. 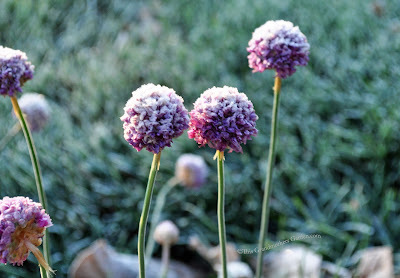 The pom-poms of the Sea Thrift aren't easily swayed by the cold. and will be one of the first to bloom again next Spring. but it's golden tones will last well into the Winter. As are the Limelight Hydrangeas. The sun is up now and the frost is melting quick. Did you catch the sparkling crown on these dainty blooms? Oh my! What do I spy? near the foundation of our home. Must have found a little sunbeam that enticed it to bloom. 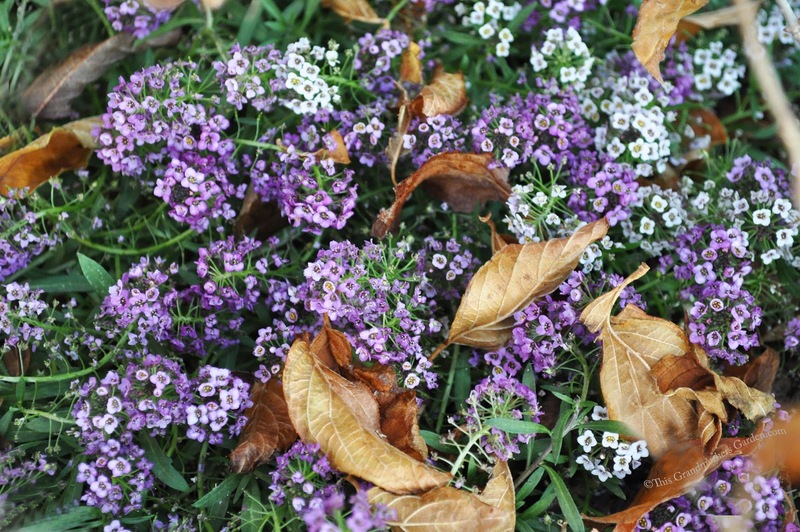 Sweet Alyssum is always a stalwart. Always the last living bloom in my gardens. still find enough warmth to keep them alive. And this Echinacea will live to dance another day. I smiled at this little blooms fortitude. All the other blooms in his garden were long gone. I'll take his pic tomorrow, I thought. and I never took his picture. Don't let the color fool you. He is literally frozen stiff. What a brave little bloom he is. 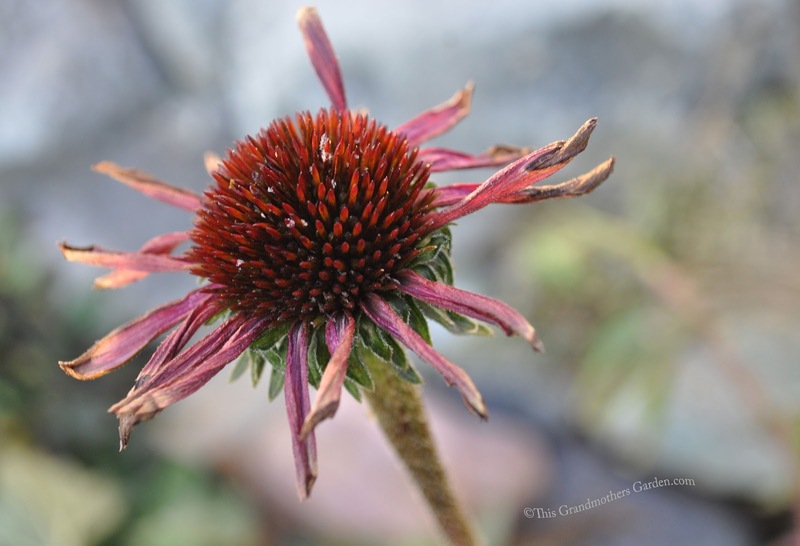 So happy to join Garden Bloggers Bloom Day. and all the others who honor this day. You inspire me to look more closely at plants outdoors. I did have a rose hip to photograph and there are other plants of beauty even now in the temperate zone where I live. Thanks. So wonderful to see any color other then brown and white right now...even if it is frozen. Yes there are some enchanting perks that come with the c-c-cold. I love this hardy crew of flowers you have, braving the cold and snow! It only makes me admire them more :) Beautiful photos, I especially love that rose. Thank you for visiting. I've always found beauty in a dying rose. Poor little scabiosa! 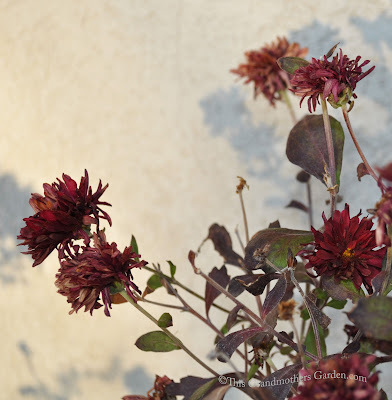 It was such a warm and wonderful fall, but we've finally had a few hard freezes, and I'm not sure there is anything left out there in my garden. Tomorrow I brave the cold morning to find out! Oh I hope you find some treasures! I love when flowers are frozen...amazing how blooms come through snow. I enjoy finding those little pretties. Sweet post and love the Sweet Alyssum poking its blooms through the leaves and snow. Happy GBBD! Gotta love the Sweet Alyssum for its staying power!! Lovely pos Carolyn! Yes... they are valiant survivors. 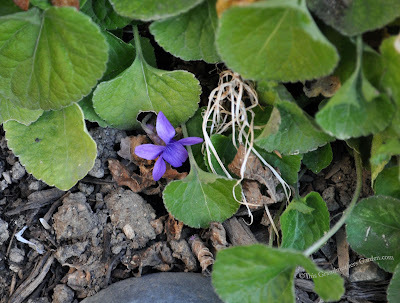 I am always amazed at how some flowers hang on through the worst of snow and sleet. I find them struggling yet still have beauty. We have not hit the snow as of yet but I do enjoy the images taken in the snow. I really like your Hydrangea in shadow, what a pretty shot. 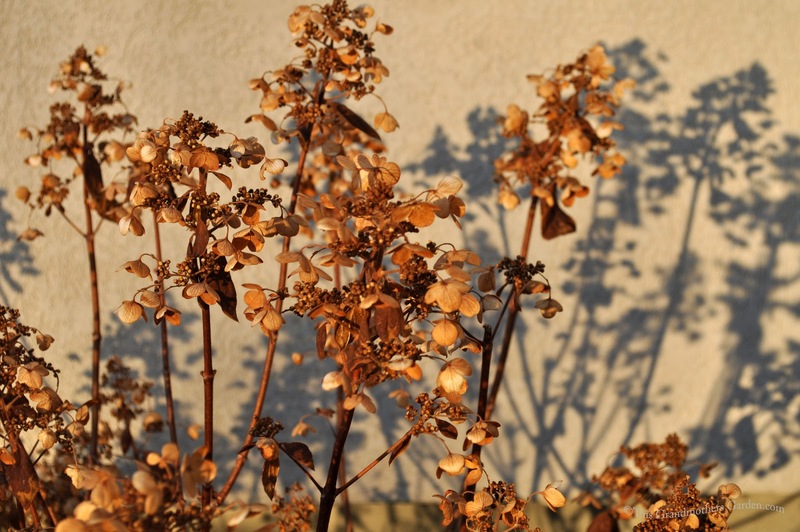 The shadow shows off all the texture of the plant and delicate detailing. I like that shot, too. Caught the emerging morning sun just right. Great blooms. You really got some great shots with the frost on them. Looks like this is their last days until next year. Have a nice weekend. Last days indeed. After so many days of freezing cold, it will be a miracle to find a bloom out there. Brrr... I'm cold looking at those pics! But isn't the frosted rose lovely? It looks like your garden will still be a source of beauty all through winter. Well, yes and no... sometimes after all the color has faded from the prolonged freezing temps, there are periods of no snow but oh so cold. That's when you have to use your imagination to see the beauty. Sweet--you found a lot of lovely blooms...in spite of the cold and snow! I love how the blooms change as the season becomes so cold. Kind of eases the disappointment of going from Autumn to Winter so quickly. What gorgeous fall scenes in your garden, and you've captured them so beautifully. 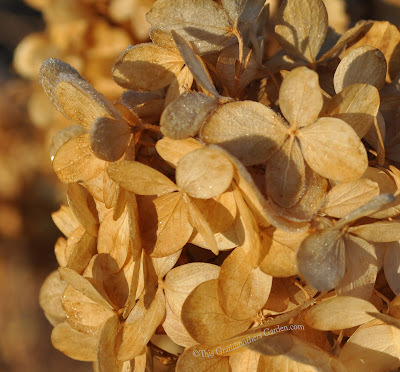 I just added a Quick Fire hydrangea to our garden this fall - nice to see the recommendation! It had been cut back at the nursery, so no blooms. Can't wait to see them next year. They are certainly a favorite of mine. 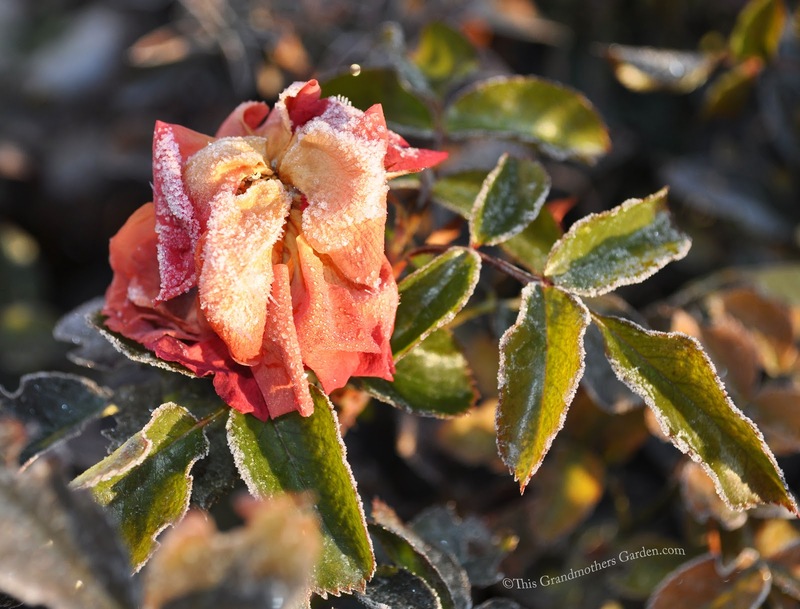 Hi Carolyn, those frosted roses look so amazing, like pieces of art :-) Great use of light in your photos, that low, glowing November sunshine really enhanced your pictures. Happy GBBD! Thank you, Helene. The morning light is magical... but oh was it cold! Hi Carolyn, I feel sorry for the poor little flowers being frosted, but this is nature. 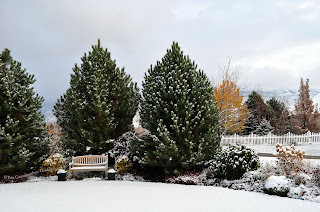 And the sight of snow and frost can be beautiful especially in your garden. Always beautiful... but it does require quite a mind shift. Either we can mourn our loss or rejoice in the new season. I've always chosed the latter. 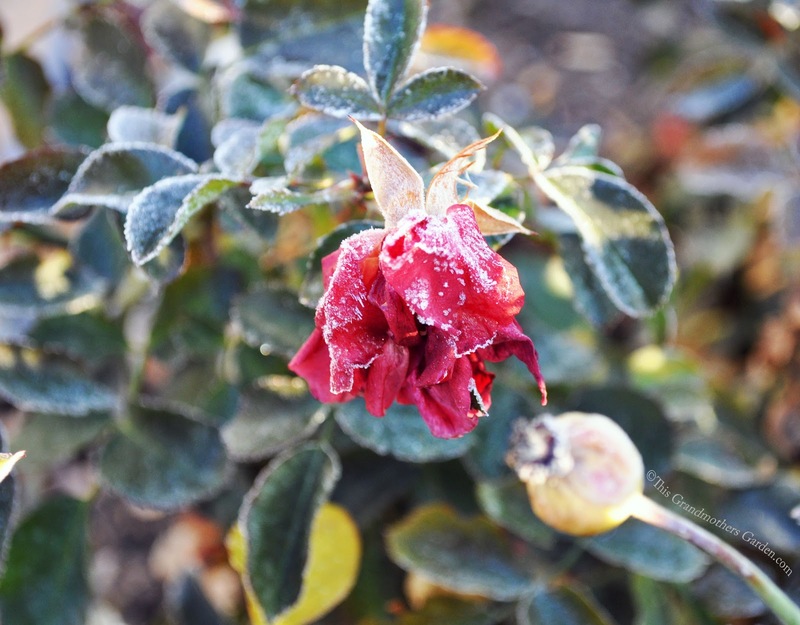 Every bloom is special in the frost and snow! The frost looks so pretty. I love when it crystalizes like that! I do, too! It doesn't happen all that often here...the moisture in the air has to be just right. Just looking at all that frost and snow makes me cold! 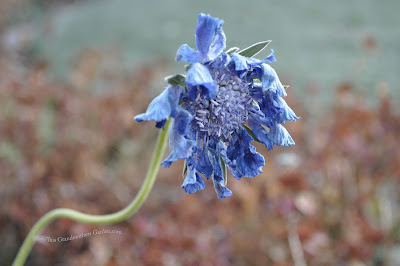 ;) But I cheered for the little scabiosa - I love that plant, and seeing its blooms always warms my heart a little. Happy GBBD! I feel the same about that little guy... definitely holds a place in my heart. Isn't that funny how some blooms just capture our hearts? Freeze-dried flowers! I'm seeing Alyssum in many gardens this Bloom Day, what a trooper it is. 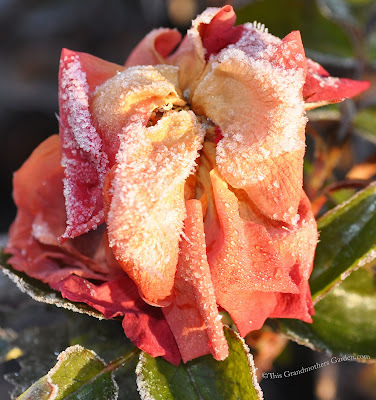 Roses are beautiful, even when frozen. Great photos. I only have snow and fog.